Quebec Chronicles | A Maple Spring? In the first of her reports from Quebec, Jane Gatensby provides a compelling account of the largest student movement you've never heard of: Quebec's Carrés Rouges. Quebec is a place where people fight for the things that matter to them. That’s something you don’t see very much any more in North America, and it, along with Quebecers’ stubborn insistence to go on speaking French while surrounded by Anglo-American cultural dominance, is what makes this Canadian province (or nation, as it often refers to itself) unique. Right now, the battle is centred around the importance of public funding, as Quebec’s Liberal government, led by premier Jean Charest, has decided to raise tuition rates in public universities by $1 625 over five years, so that in, 2017, a year of undergraduate studies will cost $3 793, still the lowest among all Canadian provinces, each of which set their own rates. With beloved social democratic institutions and a strong tradition of collective action, Quebec society is at a turning point. There is a loud, tense and very public discussion going on about what exactly Quebecers’ priorities are: should they continue to invest collectively and provide comparatively inexpensive education to everyone? Or give it up for what is being billed by the government as the only practical choice: the commercialisation and capitalisation of public goods? A majority of Quebecers say they support the hikes. But if there is anything to be learned from the events of this past month, it’s that this fight is far from over. On a typical walk through just about any neighbourhood in Montreal, Quebec’s largest city, one notices a large number of residents, young and old, with red squares pinned to their lapels, a show of support for the fight against tuition hikes. The movement has been incredibly active and astoundingly well-organized. 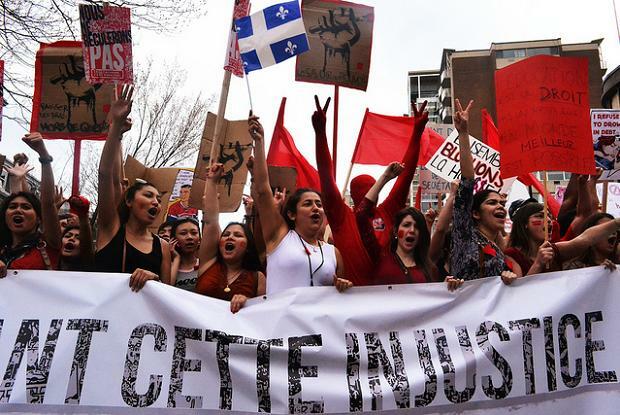 In Montreal alone, more than 150 protests have taken place since the beginning of the year, and an estimated 200 000 people attended the now-infamous Manifestation Nationale on March 22. The hikes are a constant subject of conversation, as newspaper headlines frequently feature updates on the crise étudiante, and many believe that the conflict will leave a lasting impression on Quebecois society, much like the Oka crisis or the events of October 1970. April, which marked the end of the winter term at most schools, was a particularly tumultuous month, with ongoing student strikes, increasingly radical protests and the failure of talks between student associations and the provincial government. Around 36% of Québec’s 485 832 university and cégep (college) students are currently boycotting classes across Québec, many for as long as eleven weeks. Strikes are decided upon by democratic vote in individual student unions, meaning that within each school, only a certain percentage of students are on strike at any given point. The hikes they oppose were not voted upon in Quebec’s national assembly, but instead inserted into the 2011 budget by Charest’s Quebec Liberal Party (PLQ) majority cabinet. The budget provides for $530 million dollars in additional funds over five years for Quebec’s seventeen universities, and also includes increased corporate-funded research, something the movement also opposes. In all, the hikes represent only a 0.2% savings in the provincial budget, causing many to believe that the decision to raise tuition fees was not a pragmatic but an ideological one. The debate has made its way onto campuses themselves, where green or white squares are worn by anti-strike or pro-hike students who would prefer to just be able to go to class. The use of hard picket lines to block classes has been a major cause of division among students, with some going as far as petitioning Quebec’s superior court to outlaw students from blocking classes, or to force their administration to restart courses that were cancelled because of the boycotts. The courts are proving to be a significant obstacle to strikers. On April 12, the administration of Université de Montréal (U de M), where nearly half of 40 000 students are on strike, was granted an injunction prohibiting hard picket lines on campus. This news provoked a fierce reaction among students, who held an impromptu protest that evening in U de M’s central pavillion, breaking windows and throwing red paint. A group then tried to gain entry into the administration building using an improvised battering ram. The next morning, a group ransacked the conscription office of education minister Line Beauchamp, who along with Charest is a frequent object of strikers’ derision. Beauchamp has referred to the incident several times over the following weeks, as the Liberals have tried to paint those in the movement as violent criminals, presumably to win public support for the hikes. Beauchamp has also put pressure on universities and cégeps this month to keep giving courses on schedule and to make sure students can access them. On April first (April Fool’s Day), students participated in the “March of Super-Rich Students of Québec”, ironically calling for higher tuition. 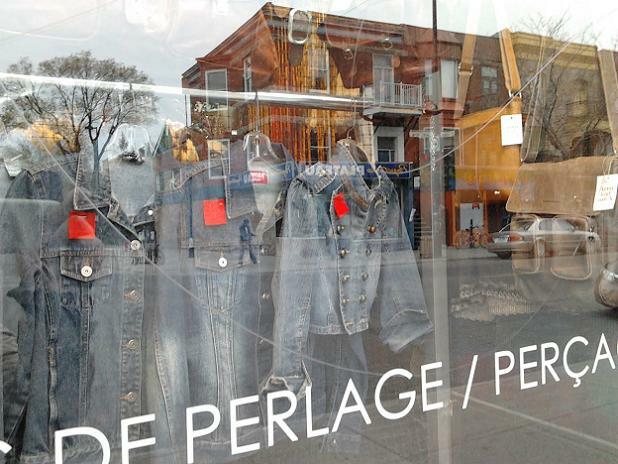 Despite the protest’s oddball message, it was typical of many that have happened in Montreal this month. Day after day, thousands of enthusiastic students braved cold weather and heavy police presence to march for hours across large swathes of the city. Protest-goers, known as les carrés rouges (the red squares) have formed a special culture of anti-establishment comradery, complete with chants like À qui la rue? À nous la rue! (Whose street? Our street!). In addition to inconveniencing motorists, the mostly-peaceful marches have at times included broken windows, paintballs, pyrotechnics and other forms of vandalism. Some of the trouble has been attributed to non-students, including black-blockers, joining in on protests. Police brutality has also been an element of the conflict, although a highly-publicised incident in early March, involving serious wounds to a cégep student’s eye, seems to have resulted in police taking more care when dealing with demonstrators. Though most students limit their involvement to peaceful protests, the movement has also included targeted actions of economic disruption. These have largely been organized by the Coalition Large de l’Association pour une Solidarité Syndicale Etudiante (CLASSE), which represents nearly 100 000 University and cegep students and is known as the most radical of the student groups. CLASSE generally tries to keep the nature of these actions secret before they happen by posting ambiguous call-outs on its website that ask students to meet at a particular place and time, where organisers then lead them in a collective action aimed at putting economic pressure on the Quebec government. One such action took place on April 11th, when students blocked the entrance to the Montreal office of Banque Nationale, Quebec’s largest bank, until police forcibly removed them using batons and pepper spray. A similar scene happened on the 19th, when a mass attempt to “shut down” downtown businesses was responded to with large amounts of chemical irritant. On April 20th, already-tense relations between protesters and the government were further stretched as protesters attempted to “cancel” the Salon du Plan Nord, a jobs fair meant to promote Charest’s initiative to invest in resource extraction and development in northern Quebec. Clashes between protesters and police began inside the Palais des congrès, a downtown convention hall where the protest was being held, and continued for hours once protesters had been pushed outside, with heavy property damage, 6 people wounded, and 17 arrests. The Plan Nord initiative has come under criticism from many groups, including environmental and indigenous rights activists, but the student movement’s main complaint is that the development plan is designed not for the public good, but to profit private companies, or as CLASSE’s flyer for the event read, “No to free mining, yes to free education”. Protesters assembled again on the second day of the Salon, but were soon kettled in a nearby stairway by riot police and carried away in city busses. Seventy-one people had been arrested by early afternoon, when the Salon was indeed declared cancelled. The violence was not restricted to Montreal that week, as students at Université de Québec en Outaouais (UQO) were wounded and pepper-sprayed as they barricaded their institution in response to an injunction. The conflict resulted in over two hundred arrests. In the period surrounding the Plan Nord incidents, Line Beauchamp let it be known that the government was now willing to sit down at the negotiating table with student groups, provided that they denounce violence. This caveat seemed to be directly aimed at CLASSE, which had gained notoriety in previous weeks for refusing to “condemn or encourage” the increasingly violent acts of some protesters, while the two other major student groups, Féderation étudiante collégiale du Québec (FECQ) and Féderation étudiante universitaire du Québec (FEUQ) had already denounced violence. CLASSE, which operates under direct democracy, met on the 22nd, and, after many hours of debate, its member associations voted to issue a statement condemning “deliberate violence against the physical integrity of individuals, except in the case of self defence”, still refusing to denounce vandalism or property damage. Beauchamp’s willingness to negotiate was a sign of strain perhaps, as the strike seems to be wreaking havoc as intended. Cégep administrators have issued a statement saying that the costs of the strike could soon eclipse the revenue from the first round of hikes, and many have already cancelled summer studies programs, as the current semester will have to be extended. City finances are also feeling the strain, as the average intervention unit police officer in Montreal has worked 300 hours in overtime already this year to deal with protests, at a total cost of 3 million dollars to Montreal taxpayers. A group of prominent public figures, including a Liberal ex-minister, has publicly called for the government to reach a compromise with students, and others have showed their disapproval of the Liberals’ actions by wearing red squares in parliament and on television. Eager to join their older siblings’ movement, a handful of secondary schools have also gone on strike. 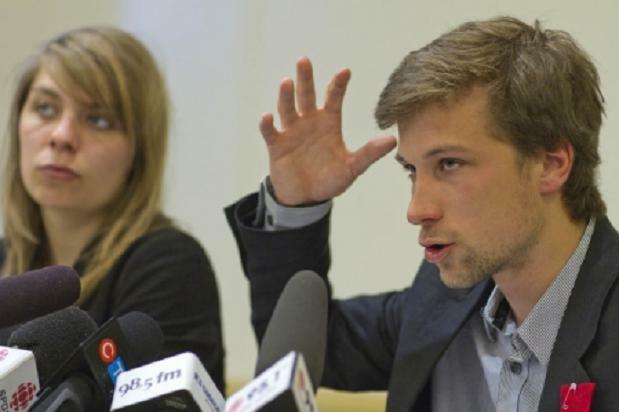 As the conflict drags on, it has turned CLASSE’s charismatic co-spokesperson Gabriel Nadeau-Dubois into a quasi-celebrity, somewhat in spite of himself. He refuses to grant personal interviews, but has appeared on multiple Québecois talk shows to promote the cause. Both he and Beauchamp seem to be engaged in a battle of hearts and minds to win over Quebec’s population, while the stakes get higher and higher. The final full week in April proved a tumultuous one for the province, as the student movement took centre-stage. At its beginning, Beauchamp begrudgingly accepted CLASSE’s denouncement of violence, but placed a second condition on the group: for talks to go forward, all participating student associations would have to comply with a forty-eight hour truce in which no social or economic disruptions could be held. CLASSE accepted the terms, saying that as they hadn’t planned any such actions over the next two days, a de-facto truce was already in effect. When negotiations got under way, late on Monday April 23rd, the government predictably refused to budge on the hikes themselves, but did offer a boost to the provincial loans and bursaries system. Things ended prematurely, however, when on Tuesday night, a group of anti-truce students organised a night-time protest in Montreal which turned into a riot. Because the demonstration, while not organised by CLASSE itself, had been publicised on the group’s website, Beauchamp barred CLASSE from talks the next [Wednesday 25th] morning, saying that the group had “excluded itself”. The FECQ and FEUQ also left the negotiations in solidarity with CLASSE. Students showed their anger in that night’s Ostie de grand manif [The F%[email protected] Big Protest], where vandalism and clashes between protesters and police led to 85 arrests, as marchers were circled at an intersection and taken away by public buses. Similar protests took place every night for the remainder of April, drawing thousands but largely remaining peaceful, with protesters booing and even physically restraining troublemakers. Protests in Québec City, though also peaceful, were marked by 81 arrests. With little hope for the continuation of talks, Charest presented a new offer to the public on Friday, which includes an adjustment to the hikes’ duration (spreading them over seven years instead of five, but indexing them higher for inflation), and additional funds for the province’s loans and bursaries program. It also used the occasion to re-publicise previous decisions to offer income-based repayment (something student leaders reject, saying that it will lead to higher fees and more debt), and to establish a committee to evaluate university spending. Although student leaders admitted that aspects of the proposal, such as the loans and bursaries boost, were promising, they rejected it, saying that it was insulting for the government to bypass student associations in hopes of winning over the general public. With strikes dragging on into their twelfth week, no one is quite sure what will happen next. 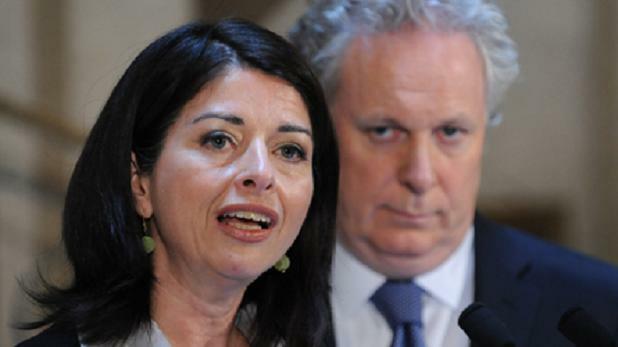 The crisis has caused a schism within the Liberal caucus, where deputies from Montreal conscriptions want to negotiate a fast settlement, while those from other regions want Charest and Beauchamp to maintain their hard line, calling protesters “spoiled children” and saying that giving in would be a sign of weakness. Meanwhile, the Parti Québecois (PQ) opposition has sided with the student movement,presenting its own plan for tuition rates indexed to the cost of living. Looking for a way forward, FECQ and FEUQ presented a counter offer on May 1st that, including a tuition hike freeze and cost-cutting measures, bumps up against not only the Liberals’ vision, but that of the universities themselves. Today, (May 3rd), CLASSE is expected to present an offer of its own that calls for free tuition in the next five years, demonstrating its members’ radicalisation. In all, the possibility of a swift resolution looks doubtful. Meanwhile, night protests continue, and, on the night of May 2nd (the 9th consecutive night of protests), came to include a visit to Jean Charest’s lavish Westmount residence. There is heavy speculation that the conflict will trigger an election, and soon. I really want to save this posting, “A Maple Spring?